Bee's Circus: 285. 39 week pregnancy update! 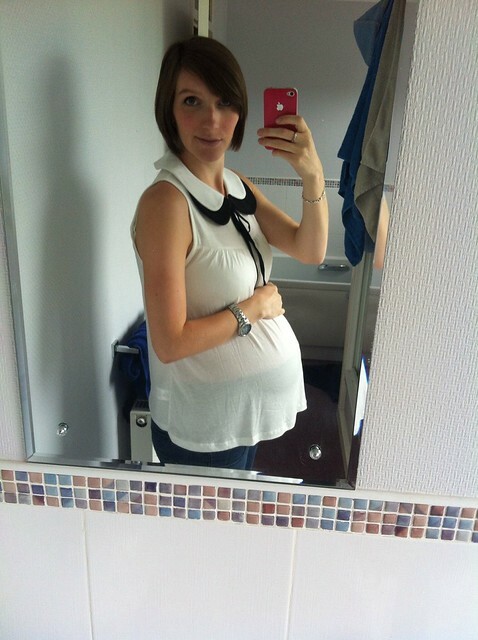 39 weeks (+2), only six days to go! I wanted to get this post up sooner rather than later just in case, though I don't feel like anything's going to happen any time soon :( I was thinking he was going to come early but now I'm more convinced he's going to make us wait, which isn't the best because I'm mega uncomfortable (and grumpy, just ask Colin!) But I know he'll be worth the wait! Baby's the size of a watermelon, (which I'm definitely buying this week t compare with!) though the measurements haven't changed since last week on thebump. Mine sure have! Everyone keeps telling me I'm bigger & that I've dropped, which I find hard to believe since he's all up in my ribs! I've lived in leggings the last few days - Sunday I had some pains because my jeans were too tight, so we're avoiding that again, what a let down! Sleep is hit and miss, as per the uge, even with banning myself from drinking after 8pm I'm still waking in the night to pee! & Staying in the same position for too long gets painful, so I'm forever tossing and turning! Luckily, my parents are awesome and took Daniel for a walk today to let me nap (Daniel was up before 6:30!) which I'm SO grateful for! Kiddo's been napping pretty well in the afternoon too so I'll be taking advantage of that tomorrow! Colin and I are still debating over what he will look like - I'm convinced I'm going to have another mini-Colin (his genes have already proved pretty strong!) & he thinks he'll have dark hair and look more like me! I can't wait to find out! Daniel is so confused about my lack of belly button, since he saw my tummy the other day he's been obsessed with checking, & saying "Oh! Button gone!!) & double checking his own! It's adorable! He even gives his brother kisses, which melts me! Missing proper cuddles with Daniel, he has to sit to the side of me because of my giant belly, but I've been making sure to get plenty of (wonky) cuddle time in this week! I'm also nesting pretty crazily, it's really sporadic & mess just keeps happening quicker than I can clean it so I keep having a break! We crossed one of the 'big' things off our list by buying a mattress yesterday, I'm going to buy/order another monitor tomorrow, order a carrier & a bath support tonight, and then we're basically ready! It's strange because I'm not in a major rush to get everything done, but we've got the important stuff anyway! Looking forward to meeting this little man! & dressing him and Daniel in the matching outfits I got them today!! Squee! !